Dallas Cowboys wide receiver Dez Bryant (88) runs with the ball after catching a pass in the second quarter against the Green Bay Packers at AT&T Stadium. Cowboys receiver Dez Bryant won’t be fined for leaving Sunday’s game with more than a minute left to play, coach Jason Garrett said Monday. Bryant again opened himself up to charges of being selfish with his early exit. However, a humble and apologetic Bryant explained why he left the game with 1:21 left as Green Bay began to run out the clock on a 37-36 victory. Bryant said he realized how his actions appeared public when he saw a picture of himself walking up the tunnel on Twitter. "Let me start by saying that was not the right thing to do, most definitely, to walk back in," Bryant said while surrounded by reporters in the teams’ Valley Ranch locker room. "I wasn’t looking at it that way, how people are portraying it, how I looked, which I clearly understand. "I’m a very emotional player. I’ve always been that way. I’ve got to do a better job of controlling my emotions. I felt like there was no way I could have sat there and watched them knee the ball and shake anyone of those players’ hands, just because of the fashion of how we lost. It was heartbreaking." Bryant has drawn criticism for his sideline behavior this season after appearing to lose his temper at teammates. This time, Bryant said he was afraid to show another kind of emotion. "I didn’t want you guys to catch me on the sideline crying," Bryant said. "It’s a pride thing. I just, I couldn’t handle it. I couldn’t handle seeing Green Bay cheering and them excited about what they’ve done. I give credit to them, they earned it and they deserved it. They stuck out and they fought, and they got that W."
Garrett received the same explanation when he spoke with Bryant afterward. "I told him I understood that and explained to him why it’s important not to do that in the future," Garrett said. "We all have that same kind of investment in that ballgame. It’s difficult for everybody when things don’t go well, and he needs to understand how to handle that. I think he’ll handle that better in the future." Bryant was adamant that his departure had nothing to do with his feelings toward his teammates. Garrett said that won’t be an issue. "I may or may not address it [to the team]," Garrett said. 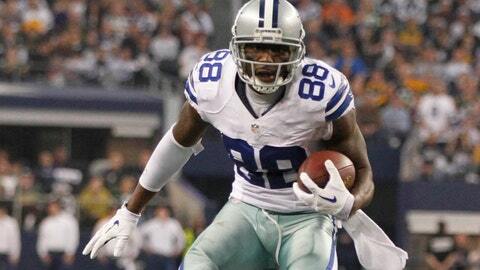 "People love Dez. People know what he’s about. He’s a great teammate, he’s got a great passion for the game. Really well-respected by his teammates."